Before booking your tickets, read this detailed Golmaal Again Movie Review only on BollywoodMDB. Golmaal Again is the fourth installment of the highly successful film franchise Golmaal, but it's not the continuation of the previous part. The latest part of the series starts off in an orphanage of Ooty where Gopal (Ajay Devgn), Madhav (Arshad Warsi), Lucky (Tusshar Kapoor), Laxman Prasad (Shreyas Talpade) and Laxman (Kunal Khemu) had once lived before moving out of it forever. After many years, when they come to know about the sudden demise of Jamnadas, the founder of the orphanage, they return to the place to offer their last respect. There they meet Anna (Tabu) and Damini (Parineeti Chopra). Anna has special powers to see and talk to ghosts. She convinces all the boys to move back to their old neighbourhood in a new house on rent. What they these guys know is that Damini is not Damini. She is, in fact, the ghost of Khushi, a girl who they had found at the gate of the orphanage years ago. When they come to know about the same, they are hell shocked. When Anna tells them the truth behind her and Jamnadas’ death, they plan to avenge their murders. What happens next forms the crux of the story. Besides the regular star cast of the franchise, there are a couple of new faces in Golmaal Again. Ajay Devgn, who has been a regular in all parts of the film, does a good job. He plays a man who is terrified even with the idea of ghosts. Being the biggest name in the cast, he gets maximum screen time and his comic timing is really good in the movie. Arshad Warsi is also good at his act and so are Shreyas Talpade, Kunal Khemu and Tusshar Kapoor. Prakash Raj and Neil Nitin Mukesh don't get prominent parts, but they try to leave a mark with whatever they have been given. Tabu and Parineeti Chopra are the newest addition to the film and both play their parts well. We have never seen them in such kind of characters before which makes the whole experience even more exhilarating. Parineeti Chopra looks glamorous despite being shown in a similar look throughout the film but that is not all what she does in the movie. She acts well and does full justice to her character. Writers have written a strong part for her which she plays with aplomb. Tabu is also fine in the film. All actors impress you with their perfectly humorous acts. Supporting cast has done a good job, too. Rohit Shetty returns to direction after his last release, the Shah Rukh Khan and Kajol starrer Dilwale, which received a tepid response at the box office. With Golmaal Again, Shetty tries to play safe by making a film which is the next installment of his superhit film franchise, Golmaal. 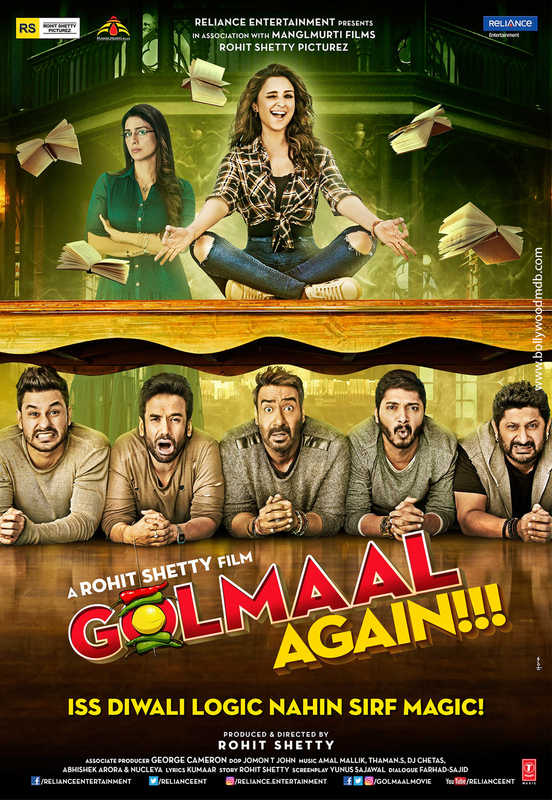 We all know that Golmaal is the biggest comedy brand in India and has a great recall value among all age groups of the audience, and Rohit just tries to make most of it with his latest film. He revisits the same old world which has yielded huge dividends for him in the past. And if all goes well, he will make a lot of money with his latest film as well. Though his last film with Shah Rukh Khan did not do well, Rohit is a filmmaker who somehow knows what his audience wants from him and he tries to offer them that in full measures. Golmaal Again is not his best work, but it has everything that the mass audience wants, from rib-tickling dialogues to a hoard of stars doing some crazy things in one single film and beautiful locations. The fanbase which the director has built over the years does not attempt to find logic in his film. They just want magic, no logic. Managing such an ensemble cast is not an easy task for any filmmaker. But Rohit does not only manage the whole cast splendidly but also takes out the best from them. He’s the coolest director in the town. The film is visually very appealing and all credit for the same goes to cinematographer Jomon T John and art-director, Madhur Madhavan. Production value of the film is quite rich which is evident thoroughly. Production design team members Swapnil Bhalerao, Madhur Madhavan and Tajamul Shaikh have done a brilliant job. The makers have spent a bomb on the film which just shows in every frame. There are some amazing stunts in the film. Editing by Bunty Nagi is average as there are many scenes in the movie which don’t add much to the narrative and could have easily been done away with. Frankly speaking, no movie from the Golmaal film series boasts of extraordinary music. Like previous three installments of the franchise, Golmaal Again too has an average album which does not offer anything exciting to the listeners. Songs like ‘Hum Nahin Sudhrenge’ and ‘Golmaal Title Track’ are foot-tapping, but none has the power to stay in your playlist for long. There are total four songs in the film and all of them fail to rise above average. Watch Golmaal Again if you want to laugh uncontrollably without trying to find any logic in the narrative (Iss Diwali Logic Nahin Sirf Magic!). If you don't take the film too seriously, you will have a good time.